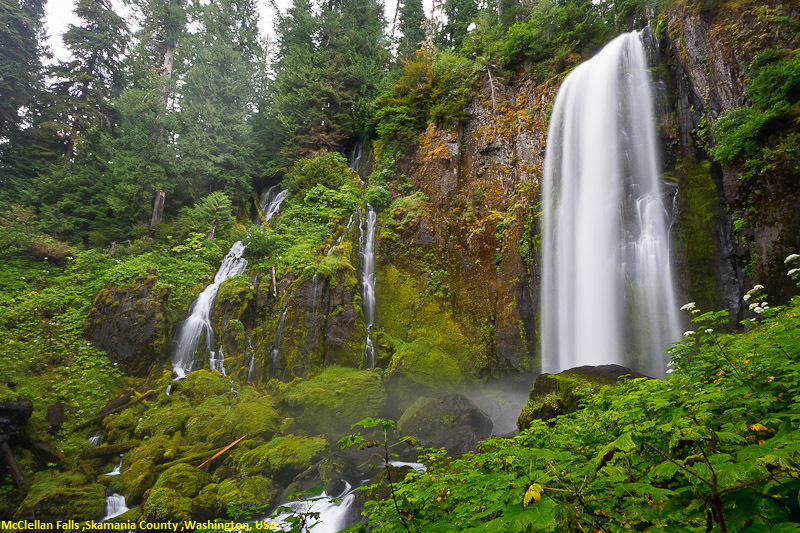 McClellan Falls is the major waterfall of Curly Creek, occurring where its stream intersects a major cliff band that runs north-south along the east side of the Lewis River Canyon, forming a powerful 143-foot tall plunging waterfall. Part of the stream appears to branch off upstream from the falls and enters the canyon in an adjacent veil to the left of the main fall. The entire canyon - walls and floor - are coated with a very thick carpet of moss below the falls, a testament to the volume of water and spray which can be present. Take Interstate 5 to the town of Woodland, and exit onto Highway 503 heading east. Follow 503 east to Cougar, and continue to Forrest Service Road # 90, just passed the Pine Creek Ranger Station. Follow FR 90 for 4 1/4 miles and turn right onto Curly Creek Road (signed for Carson). Drive for just over 3 miles to the McClellan viewpoint and park. The key to finding the route to the base of McClellan Falls is finding the proper starting point. Walk across the road from the entrance to the viewpoint parking area and scan the edge of the forest for flagging that marks a very rough path. If you find the right spot, a fairly brush free, still-in-the-process-of-being-worn boot path will lead to the bottom of the canyon in about 1/4 mile.